AFP offers a number of educational opportunities especially for the experienced fundraising practitioner. 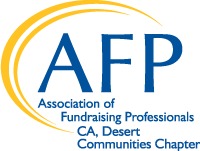 All educational content from AFP Desert Communities is approved for earning CFRE certification credits. These opportunities address both the practical skills and theoretical understanding required of advanced-level fundraisers. Visit the CFRE International website.